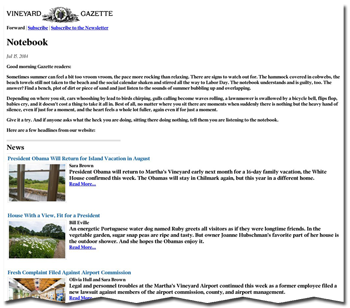 Now you can get the latest news and local color by email from the Vineyard Gazette twice a week, on Tuesdays and Fridays. Delivered directly to your email account, the Notebook offers a flavor of what's happening on the Island and an easy way to catch up on breaking news, previews of events and other items of interest. Sign up today, and begin receiving Martha's Vineyard news in your inbox this week. 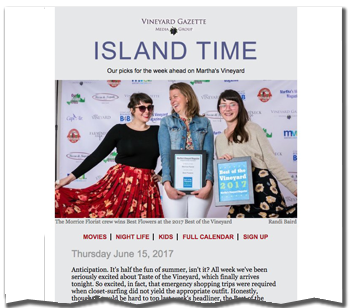 New in 2017, Island Time offers an insider's guide to the week's not-to-be-missed events on Martha's Vineyard.